Last summer during our amazing time on Jersey, Simon Nash handed me a book by Kester Brewin, Mutiny! Why We Love Pirates, And How They Can Save Us. I found the book utterly fascinating and fun, a hard to classify book that fuses theology, history, pop culture and economics. I don't know Brewin's work well, but from what I gather he's a unique thinker, known for creative and interdisciplinary fusions like Mutiny!. In May I did a class at the Pepperdine Bible Lectures entitled "Jesus and the Jolly Roger: A Church for Pirates," inspired by Brewin's book. I promised people who missed the class that I'd blog through what I shared. So here is a series of posts--a theology of pirates--inspired by Kester Brewin's book. Before we start, one programming note. This short series is not a review or accurate summary of Brewin's book. I'll just be selecting and sharing some gems of insight from Brewin. My series is more theological and orthodox than Brewin's more economic, political and theologically heterodox treatment of pirates. So, why a theology of pirates? I'm taking a cue from Jesus here, his parables in particular. As we know, in describing the kingdom of God Jesus would make comparisons that were, by turns, shocking, charming or bewildering. The kingdom of God is like a son who asked his father for his half of the inheritance. The kingdom of God is like a farmer going out and sowing seed. The kingdom of God is like a manager ripping off his boss. The kingdom of God is like a treasure hidden in field. The kingdom of God is like a net full of fish, some valuable some trash. The kingdom of God is like a wedding banquet where everyone rejects the invitation. Jesus uses these comparisons not to make a moral point (more on that in the next post), but to draw our attention to some facet, some aspect of the kingdom of God. 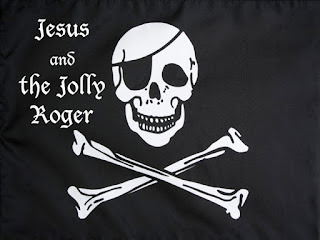 The kingdom of God is like a pirate.